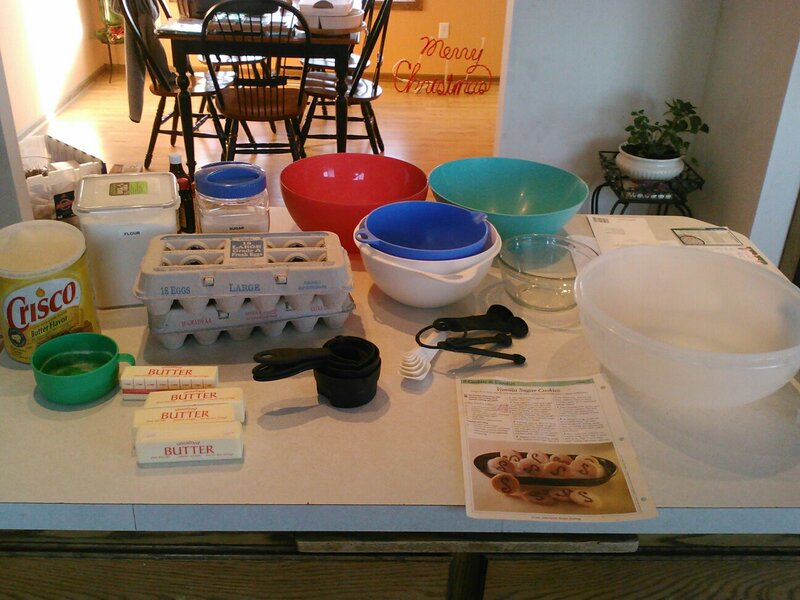 Ready to bake some goodies. Last Friday was my annual cookie baking day. I had Christmas music playing on Pandora, the Christmas tree plugged in, and I am made lots of goodies for our family Christmas party. Every year, I look forward to making all the goodies with recipes from various friends and family members. As I mix up each batch, I think of the person who that recipe came from. I think of so many memories (both happy, and some, not so much). I started with some beer bread. I used a box mix for this, and used Honey Weiss beer in it. Thought it might add a little extra flavor. It turned out great, but I’d rather make it from scratch. If anyone has a recipe for beer bread, I’d love to have it!! I went on to banana bread. I made one loaf without chocolate chips, the rest with. The banana bread recipe I use is from my ex-sister-in-law. It was her husband’s Grandma Wills’ recipe, and is hands down the best banana bread recipe I have found! 3. Add 1/4 cup milk to butter/sugar mix. Then add 1 cup of flour mixture. Keep alternating between 1/4 cup milk and 1 cup dry ingredients until all mixed together. 4. Grease and flour pans (will make 2 lg loaves, or 3 medium). 5. Bake at 350 degrees Fahrenheit for 1 hour. It’s ok to have all loaves in at the same time. Notes: I like to add chocolate chips (full size or mini) to mine. I add them at the very end before I pour the batter into the pans. Sometimes, I will even fill one, then add chocolate chips, to make both kinds. Next, I got the sugar cookie dough made, and put it in the fridge to chill until all the kids were here. 2. Beat together butter and sugar until light and fluffy. Beat in eggs, 1 at a time. Beat in vanilla. 3. Gradually add in flour mixture until well blended. 4. Knead dough into a disk shape, wrap in plastic wrap, and refrigerate for 2 hours. It will help to sprinkle flour in the plastic wrap first, to prevent sticking. 1. On a floured surface (I use powdered sugar instead, or a mix of both), divide dough in half. 2. Using a floured rolling pin, roll out dough, and cut out cookie shapes. I then made Russian Teacakes. The recipe I use is from a cookbook a friend of mine, Suzy Goodsell, made for her family several years’ back. She collected all the favorite recipes of everyone in her family, and had the cookbook published. Suzy was the leader of some women’s ministry groups I was involved with a long time ago. She is an amazing woman who is now fighting lung cancer which has spread to her brain. I always think of her when I make these delicious cookies. More powdered sugar – in a bowl to roll them in when done. 1. Mix butter, 1/2 cup powdered sugar, and vanilla. 2. Stir in flour, nuts, and salt, until dough holds together. 3. Shape into 1-inch balls, and place about 1 inch apart on an ungreased cookie sheet. 4. Bake at 400 F until set, but not brown; about 10-12 minutes. 5. Roll in powdered sugar when still slightly warm. 6. Roll in powdered sugar again when cool. After those were done, I made Ginger Snaps. I have tried gingerbread and ginger snap recipes in the past, but never quite found one I liked. Then came Molly Lee, one of the parents at the child care center I worked at in WI. She is a total sweetheart whose blog I follow. Last year, she published her Ginger Snap recipe. I decided to try them, and they are awesome!! At our Christmas party, people were gobbling them up! The last recipe I had time for during the day, was my Grandma’s Spritz Cookie Recipe. This was a Christmas favorite when I was growing up. When she passed away, I got her electric spritz cookie press. It’s still stored in the original box that she’s had for who knows how long. It far surpasses anything I have found on the market since. Every year since her passing, I have made these cookies for my family. My cousins have told me how much they appreciate my baking them. Some people like to add food coloring, or “paint” them with flour or egg whites and sprinkle them with colored sugar after baking them. I prefer to keep them white, and use my grandma’s frosting recipe to decorate them when they are cool. I usually keep a dozen or so out for the people who just want the taste of the cookies and/or the diabetics in the family who don’t need the extra sugar. The kids and I have always enjoyed decorating these with the frosting and colored sugars. They are delicious with a red hot on the center of the poinsettias, or the tops of the trees. 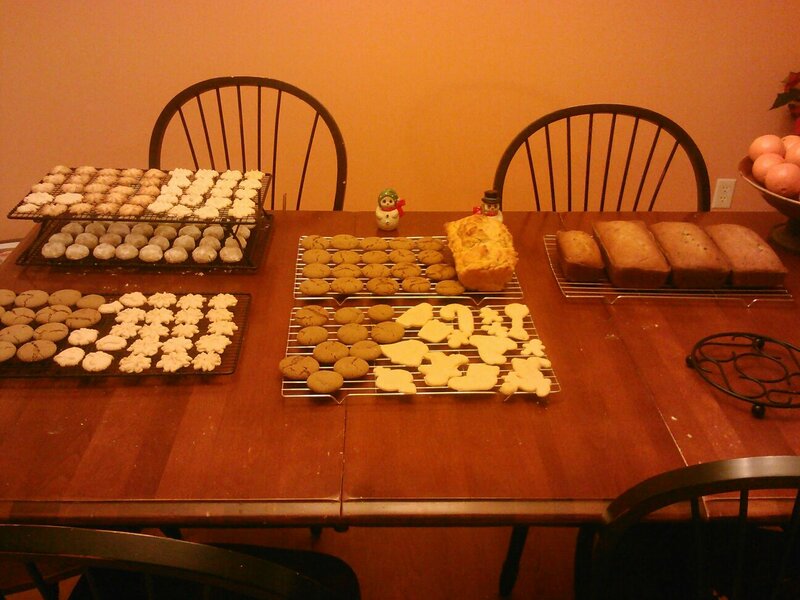 One day of baking – success! Combine all ingredients for a smooth, yummy frosting. Great for spritz and sugar cookies! After the kids went to bed, I made Puppy Chow. I had never even heard of puppy chow before a family event at my ex’s. It has become a staple in my Christmas time goodies. Many people make it year round, but I reserve it for this time of year. The recipe I use came from a box of Chex cereal. They call them “Chex Muddy Buddies.” Thanks to the web, you can find the recipe on the official website for Chex. Notes: I usually use half Rice Chex, and half Corn Chex. I have found that if your chocolate chips are older, they will not melt as well. The same is true with peanut butter. If it’s not fresh, it’s not going to have quite the same flavor once it’s heated up. I also like to make Rosettes. I have not had time to make them yet this year, but they are best made within a few days of serving them. When I was a kid, my good friend, Kristen Cairl, used to make these at Christmas time, and she taught me how. It was something I looked forward to making with her. In order to make rosettes, you need a special iron. As an adult, I walked into a Scandinavian store in Elk River, MN (just to see what they had). I was so excited to find a rosette iron with the recipe on the back! I have made them every year since. They are a rare cookie that not many people make any more. People tend to get excited when they see them. By the way, the rosettes they sell in the store are NOT NEARLY as good as home made. To me, they don’t even taste like the same thing. 1. Beat eggs, sugar, and salt slightly. 2. Add milk and flour. 4. Heat iron well in boiling oil, dip into batter. Be careful not to let batter cover top of the iron. 5. Dip batter coated iron into hot oil until nicely browned. 6. Serve sprinkled with powdered sugar. A couple of notes: your house will smell like oil for a day or two afterwards if you do not have good ventilation. I would recommend making these near a window and/or a hooded vent. I have experimented with both shortening and vegetable oil. The oil seems to get the best results. I would love to hear the traditional goodies you make! Note (added 11/24/13): A newer favorite that I make comes from my friend Molly’s blog. Here’s her recipe for Soft Ginger Snaps – SOOOO good!! I wrote this post last year. Since then, my friend Suzy (who’s Russian Teacake recipe I use) has since passed away. I will definitely be thinking of her as I bake them this year, and her children who will be spending their first Christmas without their mom. Every bite of teacake goodness will remind me of yet another wonderful thing about Suzy.